Every time a power MOSFET is switched on or off in a switched-mode power supply (SMPS), parasitic inductances cause ground shifts. This can lead to uncontrolled switching of gate driver ICs. In extreme cases, this results in electrical overloading of power MOSFETs and malfunctioning of the SMPS. 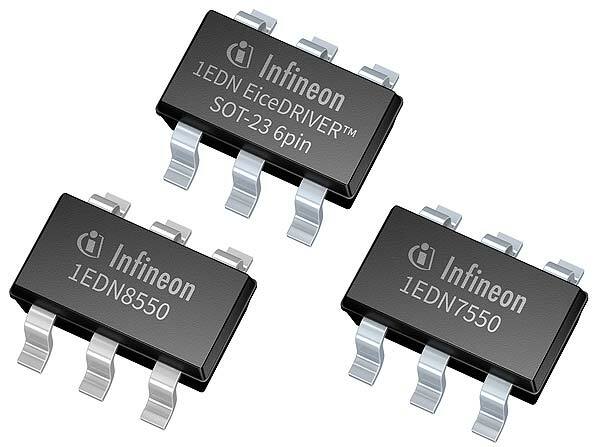 To solve this problem, Infineon Technologies AG offers the 1-channel low-side gate driver ICs 1EDN7550 and 1EDN8550. Both of the gate drivers belonging to the EiceDRIVER™ family have truly differential control inputs and can effectively prevent false triggering of power MOSFETs. 1EDN7550 and 1EDN8550 are used in industrial, server and telecom SMPS as well as wireless charging applications , telecom DC-DC converters and power tools. The devices of the EiceDRIVER family 1EDNx550 are now available to order. Further information is available at www.infineon.com/TDI .